Several years ago I worked for an educational non-profit foundation as a trainer. Every week during the school year I flew to different cities all over the U.S. and went into elementary schools to support teachers who implemented the foundation’s mathematics curriculum. It was an interesting position and I had the great pleasure of getting to know educators in such disparate places as Albuquerque, New Mexico; Detroit, Michigan; Devils Lake, North Dakota; Newark, New Jersey, Flat Lick, Kentucky; and Orlando, Florida, among others. Before taking the position I’d only flown once on my own, so I ran into a few awkward situations. Once I left my purse at the gate in Minneapolis. This was before 9/11, so before takeoff my co-worker (Patti), tapped the co-pilot on the shoulder and he radioed the gate. I fully expected them to hold onto my purse until I came back through in a couple of days, but before we started to taxi, out came a cart and my purse was handed to the pilot who passed it back to me. Of course Patti and I were the only passengers on the little 19 seater headed to North Dakota, but it was still nice. 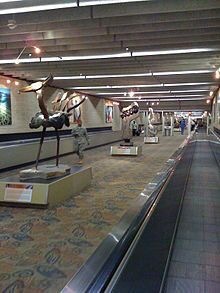 I spent much of my time in the Denver airport running from one of the larger terminals to a small one. On one occasion I was being paged for my connecting flight as I deplaned, so the race was on. Sprinting down one broad walkway I rounded the corner behind two adolescent boys. They were keeping up a good pace and blocking for me like a good offensive line should, so I didn’t even notice when they barreled straight onto a moving walkway going the wrong way. In an instant I found myself struggling to stay on two feet, my bag went backwards and I flailed my arms trying to maintain some balance. It occurred to me to stop fighting the flow and I rode backwards to the end of the walkway all to the applause of my fellow travelers. I bowed deeply and transferred to the correct walkway and managed to make my flight. Oddly enough I miss the travel.